My sophomore year at Northwestern, my roommate Cindy and I lived in an off-campus apartment. Pies were a big thing at our place. I don’t remember why, but we frequently had pie. Pumpkin was a favorite. Anyway. Thanksgiving is a few days off, but this year, instead of pumpkin pie (to hell with tradition! ), I’m making pumpkin semifreddo. Semifreddo, if you’ve never experienced it, is like meringue and ice cream falling in love. I tested the recipe a few weeks ago to make sure it would taste—and look!—good. Approved! This looks like a long recipe, but it’s fairly easy—plus, you can make it a couple of days before Thanksgiving! Special equipment: You’ll need a candy thermometer to temp the sugar syrup. If you’re using a hand mixer to beat the whites, you may need a second person to help you pour in the hot syrup. Caramel sauce isn’t complete without a splash of bourbon. I add 2 tablespoons, but, feel free to leave it out if you’re a teetotaler. You’ll need about 15 supermarket variety gingersnap cookies for the crust—I’ve added toasted pecans and salt for good measure. For the filling, I’ve made a few adjustments to the spice measurements. – Line a 9¼ x 5¼ x 3-inch metal loaf pan with plastic wrap. To make the cookie crumbs, break the gingersnaps into pieces and pulse in a food processor until finely ground. Add the toasted pecans and salt and pulse once or twice to combine. With the processor running, pour the butter through the tube and process until the mixture is moist. Press the mixture onto the bottom and 2 inches up the sides of the prepared loaf pan. Place the loaf pan in the freezer. – In a large bowl, whisk together the pumpkin, honey, and spices. Set the bowl aside. – Stir the sugar, water, and corn syrup in a medium saucepan over low heat until the sugar dissolves. Increase the heat to medium-high and let the syrup boil 8 to 10 minutes or until it registers 248˚F on the candy thermometer. – While the syrup boils, place the egg whites in a clean, dry mixing bowl (if you’re using a stand mixer/KitchenAid, use the whisk attachment). Beat the whites on medium speed with an electric mixer until they loosen, about 1 minute. Increase the speed to medium-high and whisk until soft peaks form, 2 to 3 minutes. Now you’re going to add the syrup—don’t be scared!—very carefully and slowly, start pouring the hot syrup in, with the machine still running. Beat the mixture until the outside of the bowl is cool to the touch and the whites are thick and glossy, about 7 minutes. -Add 1/3 of the meringue to the reserved pumpkin mixture and fold it in with a rubber spatula until it’s completely incorporated. Fold in the remaining mixture—this time you don’t want to over-mix; just fold the whites into the pumpkin, turn the bowl about 90˚, and repeat the folding action. Do this a few times until the mixture is just combined. Fold in the pecans and toffee bits and spread the mixture into the frozen gingersnap crust. Cover the semifreddo with plastic wrap and freeze at least 8 hours and up to 4 days. – Stir the sugar, water, and corn syrup in a medium saucepan over low heat until the sugar dissolves. Increase the heat to medium-high and let the syrup boil until it is a deep amber color, about 8 minutes. Remove the pan from the heat and whisk in the cream, butter, and sour cream. Return the pan to the heat and stir in the vanilla, bourbon, and salt. Cook 1 to 2 minutes, just until the sauce is smooth. When ready to serve the semifreddo, heat the sauce a bit. 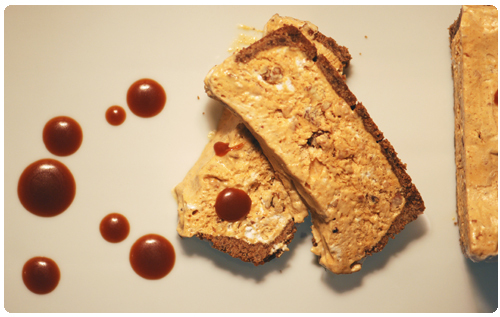 – To serve the semifreddo: Wipe the sides of the loaf pan with a towel dampened with hot water. Invert the semifreddo, then turn over and cut into slices. Serve with the warm caramel sauce.